Tax Day (also known as Larry's birthday) has come again. Having owed money to Uncle Sam for the last several years, we were curious to see what this year would hold. 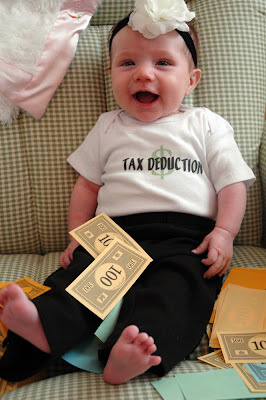 As it turned out, April 15th proved to be to our advantage this time around; and all thanks to a little tax deduction named Ava. Yes you, Ava. 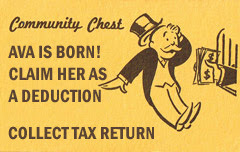 You see, in the game of life (or Monopoly as it may be), having children is a great thing when it comes to doing your taxes. 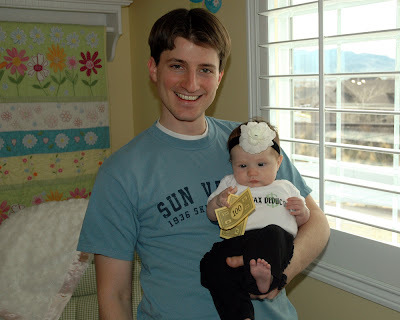 And so this year Ava gave her dad a great birthday present which came in the form of a generous tax return. 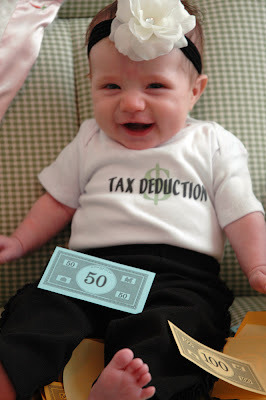 However, being a baby the tax return didn't mean all that much to her. We tried giving her some Monopoly money so that she could join in on the fun, but as you can see below from her look of general disinterest, the concept appeared to be lost on her. Or was it? Next we sat her down in a chair and gave her some more play money...then she began getting excited. So we gave her some more money and she started getting really excited. The more money we heaped on her lap the more excited she got. So on second thought, we think she's got it all figured out after all. She was just playing us for suckers. looks like you did have a good day with Ava. 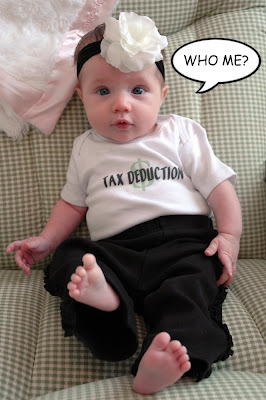 Granny O said: She is the best little tax deduction around. What a darling child! Larry, happy birthday! What a delightful day for you. 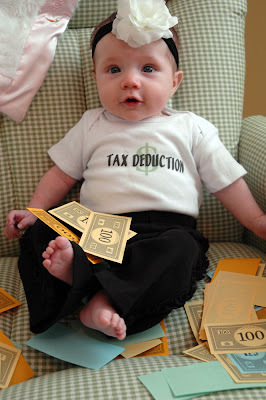 That "TAX DEDUCTION" shirt she has on is great. Where did you get it? The shirt is from Target. They have a lot of onsies there with funny stuff written on them. Krista...she's too cute and so giggly!!! I love the pictures...and I've missed out on the recent posts since I've been in Minnesota...but I'll be updating my site too...but Ava is simply adorable and so happy in the new pics!! !